ANAHEIM — For the San Francisco Giants (9-12), their 4-2 victory over the Los Angeles Angels (14-8) had just about everything they could ask for. 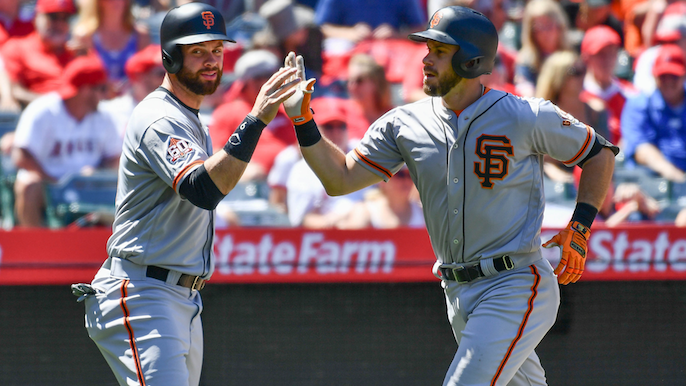 Not only did the Giants win their first series of the season, but Sunday’s victory featured another dominant pitching performance from Johnny Cueto, and home runs from Brandon Belt and Evan Longoria. It even had a little bit of history. If you showed up late to Sunday’s game, you missed a record-setting plate appearance by Belt in the first inning. 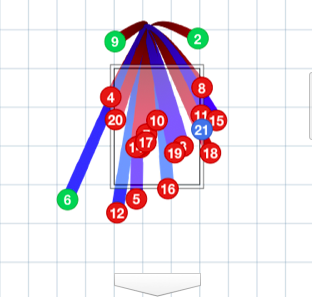 In an at-bat that took 12 minutes to complete, Belt worked Angels’ starting pitcher Jaime Barria to 21 pitches before lining out to right field. After reaching a full count nine pitches into the at-bat, Belt fouled off the last 11 pitches. It broke a record previously held by Ricky Gutierrez, who had a 20-pitch at-bat against Bartolo Colon in 1998. What you also missed was the Giants leaving the bases loaded without scoring in the first inning. Joe Panik led off the game with a single, after going 1-for-19 over the last five games, and finished the game 3-for-5. Andrew McCutchen and Buster Posey filled the bases with back-to-back singles, but Longoria and Pablo Sandoval both popped out to end the inning. The Giants wouldn’t make the same mistake in the third as they took advantage of another bases-loaded opportunity to take a 3-0 lead over the Angels. After using 49 pitches to get out of the first, Barria was pulled after walking McCutchen to load the bases. Buster Posey drove in the game’s first run on a double play when Noe Ramirez entered the game. One batter later, Longoria hit a two-run home run, his fourth of the season. Barria took credit for two of the runs scored and allowed five hits and a walk in his two innings of work. Belt hit a home run to kick off the fifth inning, giving the Giants a 4-0 lead. He’s now homered in each of his last four games, totaling five for the year. He finished the game 3-for-5. That was plenty of run support for Cueto; who held the Angels hitless through five innings, allowing only two walks while striking out six. He lost his no-hit bid when Ian Kinsler hit a leadoff single in the sixth, which led to a one-out bases-loaded jam. Shohei Ohtani singled after Kinsler slid safely into second when Brandon Crawford bobbled a grounder, a call which was upheld when challenged, to bring the game-tying run to the plate. Nonetheless, Cueto induced an inning-ending double play. Luis Valbuena hit a ground ball to Belt and Cueto instinctually sprinted to first, completing the double play to extinguish the threat. There was a momentary scare when the trainers checked on Cueto in the third. He appeared to have stepped into a divot on the mound and aggravated his previously sprained ankle. Fortunately for the Giants, Cueto stayed in the game and after hitting Martin Maldonado, he induced a double play and ended the inning by striking out Mike Trout. He went on to pitch six scoreless innings; allowing two hits, two walks, and striking out seven. Cueto hasn’t allowed a run in his last 14 innings in his last two starts, dropping his ERA down to a major league-leading 0.35. It’s also the lowest ERA posted by a Giants pitcher through his first four starts of a season since Ray Sadecki in 1968, who held a 0.25 ERA in 36 innings. Giants say Johnny Cueto's 0.35 ERA (1er, 26.0ip) is the lowest by a Giants pitcher through his first four starts of a season since Ray Sadecki in 1968 (0.25 ERA). When Cory Gearrin entered the game in the eighth inning, the Angels wasted little time in cutting the Giants’ lead down to 4-2. Kinsler’s leadoff single was followed up by a home run from Trout. Those were the only two batters Gearrin faced as Tony Watson entered the game and kept the Angels from causing any more damage. Hunter Strickland manned the ninth and earned his third save of the season, despite giving up a pair of base hits to put men on the corners. The Giants head back to San Francisco to host the Washington Nationals for a three-game series, where Chris Stratton is expected to face Gio Gonzalez.